David Cameron’s new cabinet is merely a front for a Dalek invasion designed to destroy the word and everything in it according to according to former Doctor Who Christopher Eccleston. Speaking to John Humphreys on his Today Programme Mr Eccleston said “You don’t get to be Doctor Who for a whole series without noticing when there’s something badly wrong. 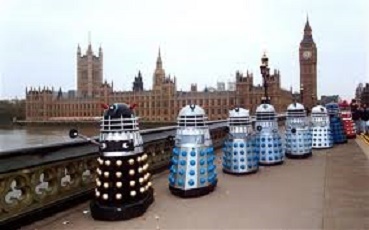 You’ve got a Culture Secretary who wants to exterminate the BBC, a Minister for Equality that wants to exterminate gay marriage, a Health Secretary that wants to exterminate the NHS and a Justice Secretary who wants to bring back hanging, or more likely revealing his true Dalek colours and exterminating people with some sort of laser gun attached to his lumpy metal shell. Or with steam if it is one of those early Daleks that Peter Cushing battled with. “If you ask me we’ve had a narrow escape from Labour who I have always suspected of being an evil alien race who have arrived here in disguise with the sole intention of sharing things out a bit more equally.” He explained. “I’m not ruling out Dalek Gove and Dalek Hunt, I mean Michael and Jeremy making some difficult decisions though.” He added.